Have you ever walked your German Shepherd with a leash on one hand and a cup of Starbucks with the other hand? If you haven’t, we bet you still haven’t found the best collar for German Shepherds. Your German Shepherd is no pompous Pomeranian. He may not have an idea how powerful he is yet, but we are pretty sure you are already aware how strong his reflexes are even as a puppy. Now, if you allow your dog to continue to walk the way he wants and barks until he gets his way, you will become barking mad! Unless you become the “lead dog”, the scenery will never change! But with proper training and a good collar to boot, you can enjoy your walks and outings peacefully with your mighty canine buddy. The Olivery Martingale Braided Collar and Leash highlights a dog-friendly design that adhered to the criteria used in canine search and rescue teams. It is handcrafted to perfection using eight braided nylon threads. Plus, it has a stainless steel extension so your dog can twist and turn without any problem. 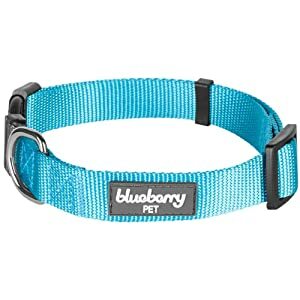 The thick weaved collar fits snugly around your dog’s neck like a chain choker but it won’t cause him any discomfort even when you need to snap his leash tight. Meanwhile, the leash provides you maximum control over your German Shepherd without causing irritation to your hand. The Herm Sprenger Ultra-Plus Prong Dog Training Collar is here to prove that not all prong collars can hurt your dog! This high-quality prong collar from Germany is an invaluable tool when it comes to leash training. Its patented center plate produces a tolerable amount of pressure when your dog tries to pull away, which is enough to make your dog redirect his attention towards you. Plus, the tips are rounded off. Therefore, it safely and effectively corrects your dog’s incessant need to pull. Additionally, its fastener plate provides a more reliable connection. As you can see, this beautifully-made stainless steel collar is marked with the Herm Sprenger signature. The links themselves look amazing too! You also have the freedom to individually add or remove the links to get a custom fit. This collar is inarguably small at ¾ inches but it packs a lot of punch. Its clasp is super strong and its adjuster won’t loosen over time. The fabric is lightweight but very sturdy. It won’t fray if you pull it apart or if you wash it countless times. Overall, it is really a super solid collar. So, make sure you have stashed away at least one Blueberry Pet Classic Dog Collar. With so many color options and a bandana to boot, you and your pet can go matchy-matchy on a fancy schmancy date! The material construction from the weather-proof nylon to the iron chain to the rings of the Mighty Paw Martingale-Style Collar is all very robust! Although its connector is plastic, it is heavy-duty and confidence-inspiring to boot. The quality of the collar as a whole is astonishing and significantly ahead of other collars within its price range! Additionally, this collar doubles as a training collar. It tightens under tension, producing firm and balanced pressure that is safe and humane enough for your beloved pet. It also has a quick-release feature, which is very important should your dog get hung up on something. Dog owners who love to walk, run, hike or jog as the sun goes down will be relieved to know that it has reflective stitching, too. materials used are top notch: weather-proof nylon, 100% iron chain, heavy-duty plastic, etc. If you have a bullheaded German Shepherd despite the obvious constriction of a collar, then it is time to switch to the Gentle Leader Headcollar. Like a halter, it sits on your dog’s neck without applying pressure on the throat. Rather, the pressure is applied at the back of the neck. Because of the placement of the nose loop, your dog can quickly understand which direction you want him to go. We suggest that you watch and utilize the training guide that comes with this collar. It is also worth mentioning that the Gentle Leader Headcollar is a far cry from a muzzle. Unlike a real muzzle, your dog can use his mouth to feed, drink, play, etc. This harness connects like a saddle and fits like one, too. Basically, it is a saddle, but for your dog. So, if your dog is as stubborn as a donkey, then you could never go wrong with the EXPAWLORER Best No-Pull Dog Harness! This model is perfect for large breeds with an exceptionally large chest and rib cage, like the German Shepherd. It easily slips under your dog’s armpit and snuggles comfortably. The straps won’t dig into your dog’s skin or cause chafing. Additionally, this harness has a padded jacketing made with a quick-drying material. Hence, your dog’s harness stays dry under a sun shower. It is also easy to spot clean. Rest assured your canine sidekick won’t mind being buckled into it because it lacks the unnecessary frills. Inspired by the British-style slip lead, this handmade product is highly effective in obedience and leash training. It is a nicer version of a collar minus the spikes! The lead itself is a polypropylene rope that is waterproof and machine-washable to boot. It measures half an inch in diameter and is absolutely soft on the hands. Who’s walking whom? You or Your German Shepherd? Leash pulling is a common problem that extends in all breeds, life stages, and activity levels that leave dog owners in a stressful situation. But if you have a powerful canine like the German Shepherd, then your troubles go double! That is why you need to equip your mighty dog with a collar that allows you to control where his attention and focus go. 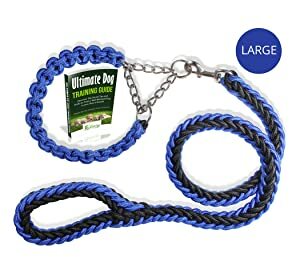 Likewise, it is easy to reach the end of a leash that is attached to your dog’s collar in case he suddenly runs after something. A good collar to a dog is equivalent to a new notebook to a pupil. It is a vital tool whether you train him on your own everyday or when you enroll him for training classes. It helps control unwanted behaviors, aggression, and anxiety issues without causing your dog pain. Vital information such as ID tag, your phone number, health info, GPS locator, etc. can be attached onto your dog’s collar. Whether your dog has escaped the garden or has been dueling squirrels in the neighboring village, you can rest assured that a good soul can deliver your best friend back to you. German Shepherds are born with a unique head shape and a thick neck. If the collar does not fit perfectly, any GSD could easily slip out of it. So, how do you find the right size? With a measuring tape, measure the diameter of your dog’s neck that is halfway between the back of his head and top of his shoulders. The collar should always rest on the middle of the nape since the top portion of their neck is where the spinal nerves are located. Placing the collar on the bottom most part of the neck is also not an option, as it is too wide. Add at least one inch for allowance. You should be able to slip two fingers between the collar and your dog’s neck. Choose a collar that is at least one inch in width to prevent a robust dog from slipping free. There are various types of collars. In order to find the best collars for your German Shepherd (GSD), you also need to take into account his current behavior. Does he consider you as the pack leader? Or does he incessantly pull towards every animal he sees? Look into the following types so you can make an informed decision. Prong or pinch collars are mostly used by professional trainers for temporary correction. It tightens around the dog's neck when the lead is pulled, getting his attention. Head collars, also known as halters, are attached around the head and behind the ears. These collars gives your dog subtle correction by pulling at your dog’s muzzle. Harnesses were designed to provide working dogs more pulling power. 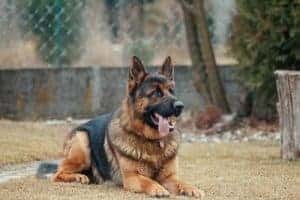 Although it means you will be having less control over your robust German Shepherd, consider this option if your dog currently suffers a respiratory or throat problem. Nylon is a durable material with water-resistant properties, making it ideal of virtually any location and season. Many brands offer a myriad of nylon collars with cute colors and patterns, since nylon are versatile and inexpensive to boot. Metals and chains, on the other hand, are more suitable for large dogs with behavioral problems. These materials are the toughest of the bunch and so, they don’t come cheap. 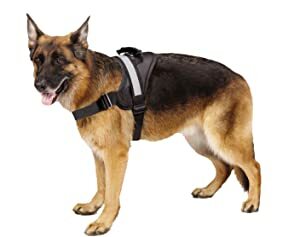 Nevertheless, GSDs are not meant to wear these types of collars for extended periods of time. Lastly, we have the most expensive material, leather. Leather collars are preferred over any material as they are soft on the skin, looks gorgeous, and its durability simply offsets its price! However, beware of fake and chemically treated leather as they often do more harm than good. Heading out for a walk is an incredible way to bond with your dog and at the same time, get some exercise and fresh air. But conventional collars can hurt your dog, particularly if you have a German Shepherd who pulls so hard. Your arm could feel like it would get pulled out of its socket while your hand would get red from gripping the leash. That is why we cannot recommend the Olivery Martingale Braided Collar and Leash highly enough! The set is complete with the features designed to eliminate the frustration from walking your German Shepherd. This collar and leash combo is the wedding of aesthetics and functionality. With it, you won’t feel like trying to walk a brick wall ever again! However you can select any one of the perfect collars for German Shepherds to try out and see which one is right for your dog.